If you’ve ever had occasion to read the 4th century Roman cookbook De Re Coquinaria, popularly known as Apicius, you will have noticed that an ingredient called garum seems to make it into just about every savory dish, and even some sweet ones. Garum—a condiment made from fermenting fish—was a common ingredient back then, playing a role in ancient Roman cookery along the lines that salt does today. A descendent of garum made with anchovies called colatura di alici is still made in the Campanian town of Cetara. Its most common use these days is to dress pasta, typically long pastas like spaghetti or linguine. 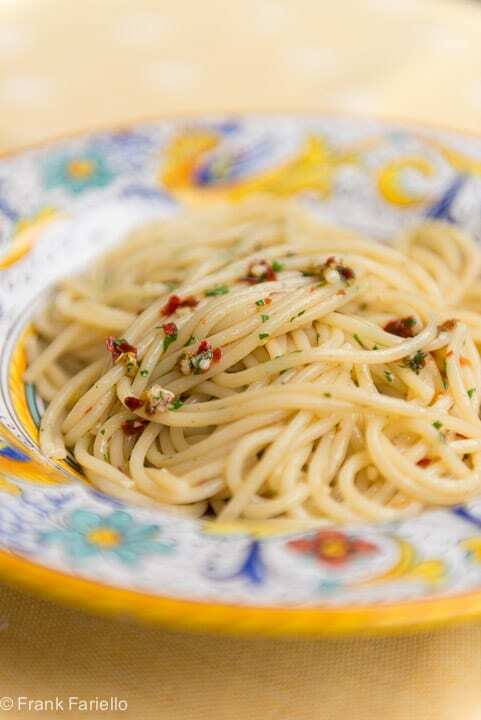 To make spaghetti alla colatura di alici, this precious elixir is combined with the typical ingredients for making aglio, olio e peperoncino—garlic, olive oil, parsley and red pepper. The resulting uncooked sauce is tossed with hot, well drained pasta and served up right away. Traditional for Christmas Eve, this quick and easy dish can be enjoyed any time of year. In fact, I think it makes for a particular nice summer pasta. You can feel free to adapt the recipe here to suit your taste, especially when it comes to the star ingredient. The measurements are really just suggestions to get you started. A pinch or more of red pepper flakes, q.b. Put the spaghetti on to boil in unsalted or very lightly salted water. (NB: It’s unusual not to salt water for pasta well, but bear in mind that the colatura is very salty.) Cook until al dente. While the spaghetti is cooking, mix all the remaining ingredients in a bowl until they are nicely amalgamated. Taste and adjust the measurements to taste—a bit more colatura if you want a stronger taste, for example, or more red pepper if you want more heat. Asian food lovers will probably be thinking that colatura is basically the same thing as Asian fish sauce. You’d be right, although colatura is a bit more concentrated than most Asian fish sauce. I’ve tasted Red Boat, a good quality fish sauce, side-by-side with colatura, and, truth be told, the difference is pretty subtle. And though my Italian friends may well hang me for saying so, seeing as Asian fish sauce is much easier to find here in the US—and costs a fraction of the price—I’d be happy using it as a substitute for the elusive cetaresi elixir. Avoid, however, cheaper fish sauces, which tend to be too diluted and include sugar. As for any simple dish like spaghetti alla colatura di alici, the quality of your ingredients will decide whether you wind up with something truly special. Besides the colatura itself, it’s important to choose best quality spaghetti or linguine. Look for pasta that’s made with durum wheat (of course!) preferably extruded through bronze dies, which gives the pasta a slightly ‘rough’ surface, perfect for catching this rather slippery sauce. If you can find pasta from Gragnano, so much the better. Not only is Gragnano famous for having the best pasta secca in Italy, Gragnano lies only a few kilometers away from Cetara, just across the base of the Sorrento peninsula. The other key ingredient is the olive oil—look for a nice, fruity, deep green extra virgin oil of the southern Italian variety. My personal favorite at the moment is a Sicilian extra virgin called Frantoia, from M. Barbera & Figli. It’s not cheap, but has wonderful, deep flavor. YouTuber Mimmo Corcione has a particularly lovely variation on this dish that he calls linguine ai sapori ‘cetaresi’, or linguine with the flavors of Cetara. To the sauce described in this post, he adds a bit of anchovy and basil, and then emulsifies it all with a hand mixer until creamy; the pasta is topped with a freshly grated lemon zest. If you understand Italian—or even if you don’t—do check out his YouTube video. I’ve been a big fan of il grande Mimmo for quite a while. His winning manner and charming Neapolitan accent never fail to bring a smile to my face and, more often than not, his recipes start a rumbling in my stomach! Put the spaghetti on to boil in unsalted or very lightly salted water. Cook until al dente. I’m somehow missed this post! I’ve been having fun with colatura. So happy to have discovered it! We often use the Artisian pastas from Fabbricca Della Pasta Di Gragnano. Once you taste their pasta, it is not easy to go back to Ronzoni or Barrilla! ? You’re so right, Joann. The pastas from Gragnano are the best! Now i have to get a bottle of Colatura. I love Anchovies so much, so that pasta dish is one my list to try. I have never tried Colatura before, so I am not sure, if the sauce alone is savory enought for spicing the pasta, can I add some anchovy filets too, or would it be to salty. Further would a bit of sea food, like roasted king prawns or calamari a good addition? Thanks for help. I have eaten plenty of alici but never had the colatura. And I don’t think I have seen it in the stores in Perugia. I will look again. P.S. Pane burro e alici is a great favorite of mine. Elegant in it’s simplicity – thank you for posting this Frank. You’re welcome, Paula! Thanks for stopping by. Frank – Thanks for posting this recipe. I have never used collatura, but have read about it in an ancient Roman and Greek cookbook in my collection, and of course, I’ve seen it at Gustiamo too. Yes, it’s costly, but as you say, a little goes a long way. I’ll have to put a bottle of that on my list for my next order. Your suggestion to use bronze-die pressed pasta is a great one too. I’ve gotten spoiled by all the great pastas available in my area, but some are also available online too. Again, they cost more than the supermarket varieties, but they’re so worth it. As always, you have a great blog with a wealth of good information on the backstory of the dish. Happy Labor Day weekend. Let us know what you think of colatura once you’ve tried it. And have a great weekend, too, Linda! Hmmm… I can imagine the challenge of finding pasta from Gragnano in small town in Minnesota. But there’s always online! yes, I agree…colatura is a great, star ingredient. It is very expensive also in Italy to be fair (quality one). In the UK I use too good fish sauce, which I keep by the oils because I tend to sneak in few drops of it in many dishes (stews, braises, sauces) – it adds a good savory note, if used judiciously. Thanks for your comment, Stefano! And in particular for the link to Marinella’s YouTube channel. She’s awesome. Her videos are delightful and her books look worth checking out. Have you downloaded any?